Random Observation/Comment #191: Contrary to popular belief, I am not obsessed with desserts or sweets in general. I have a sweet tooth (somewhere among the carnivorous ones and passion towards cherry tomatoes), but it had always been geared towards cheesecake, ice cream, and cookies. 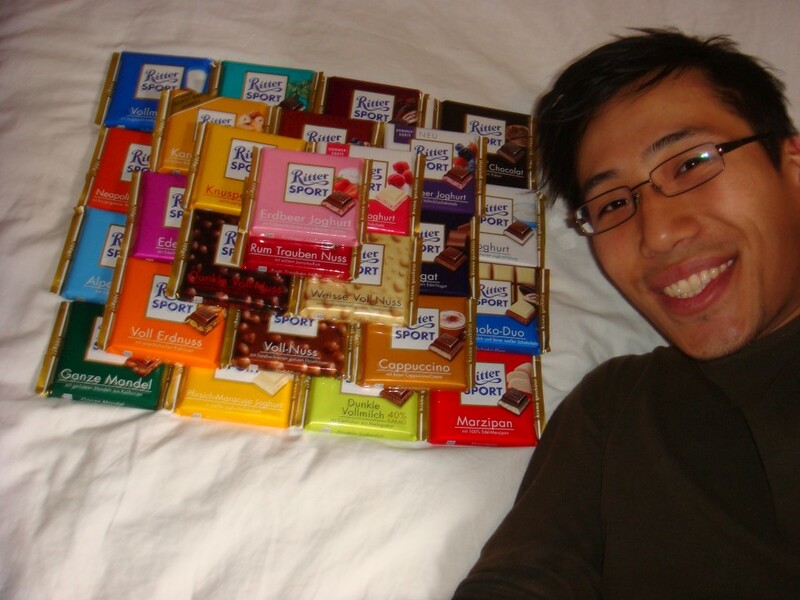 This new project for Rittersport chocolate is not because of some endorsement they are paying me or any ploy to invite girls over to my room (although…). 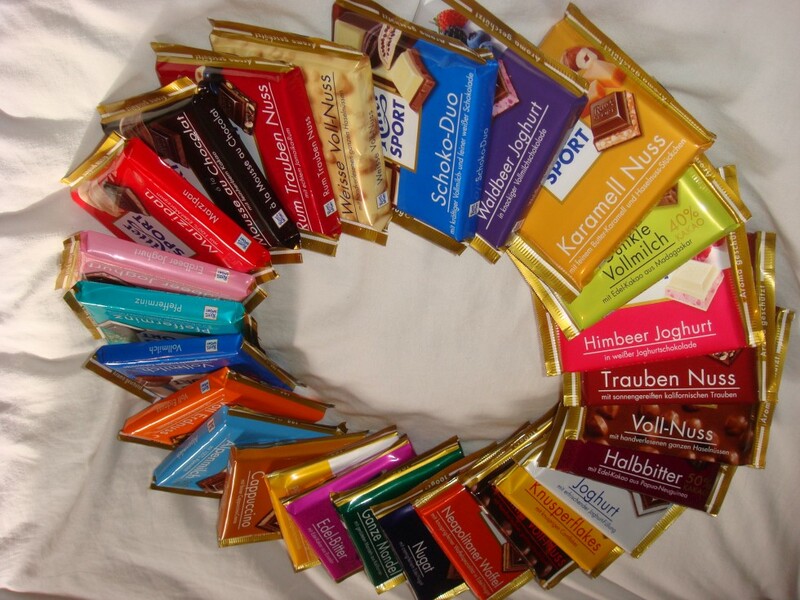 The purpose goes deeper than merely trying every type of chocolate – it’s the overall completeness of an adventure. It’s just a simple short term goal that brings me a great deal of pleasure for a relatively small price. I would have spent the money on snacks elsewhere, but forcing myself to buy everything at once and record these findings just seems much more calculated. I’m all about being spontaneous, but these side projects, no matter how calculated they may be, make life interesting. I have so many on-going projects involving collections, but each of them don’t have an end date. I will never try every restaurant in NYC or drink every beer in the world. I’ll have a great opinion about each of these experiences for a small list of “top 10s” in each category, and yet I want something so much more. Tackling a new flavor of chocolate for a particular brand brings me a level of accomplishment that a project will be completed. Yes, this will hinder my goal of a six-pack – just as the beer and wine taste testing has – but this can easily be thwarted with some extra hard work. This step towards making a reasonable schedule for this project had much more significance than I had initially intended. It’s not just “Hey, wouldn’t it be cool if I try every flavor of chocolate from Rittersport?” It’s “Hey, why not?” I’m lucky enough to be half way around the world in a foreign country with new customs and particular quirks – don’t I have the obligation of living this to the fullest and showing it to my friends and family? It’s part of the reason I started this blogging and twittering thing. I just want to share, and the virtual communities have made it simple by giving me a car and building a highway. Life is about hobbies and ways to spend your free time. The money thing is sort of important to maintain the life styles and support some expensive hobbies, but what fun is a life filled with paying off debt? What fun is life without the occasional pothole, aggressive drivers, and unbearable traffic jams? Excess of these metaphorical obstacles could cause stress and frustration, but I think I would be pretty damn bored without a finish-line and some big fat guy in a suit blocking the way. The truth is – I love the challenge and I love making small doses of controllable chaos. It makes me feel productive and it makes success that much more rewarding. Hopefully, a career will help feed the purpose of my hobby while not suffocating it with obligatory deadlines. For example, my brother loves buying old 1990 BMWs, fixing them with his mechanic friends, driving them for a few months, and selling it for the profit that barelycovers the gas and insurance cost over time. Obviously, it’s not the monetary gain after selling the car; it’s the priceless fun he had learning about how everything works and driving down a windy rode with the top down, listening to 80’s music. And my brother’s career of designing roads just somehow nicely completes his story. He’s dedicated to his work because his projects will be providing the essentials for millions of cars for the next 25 years. After all, a car is pretty useless without well-designed roads connecting destinations. Through these travels, I have searched for those stories that help me reflect on my own. I’ve heard so many that make sense, and I’ve heard so many that seem just as lost (if not, more so) than I am. It gives me comfort that we’re all looking for that purpose in each of our individual lives. I guess the first step is to find what makes us happy. Whether it be, drinking out with friends or playing video games in front of the computer, we shouldn’t conform to what everyone says is fun. One thing is for sure: We are social creatures and happiness lies somewhere within our importance – being wanted, needed, and missed – within a community. It is in this place where I find my home. One Response to "Much More than a Rittersport Obsession"